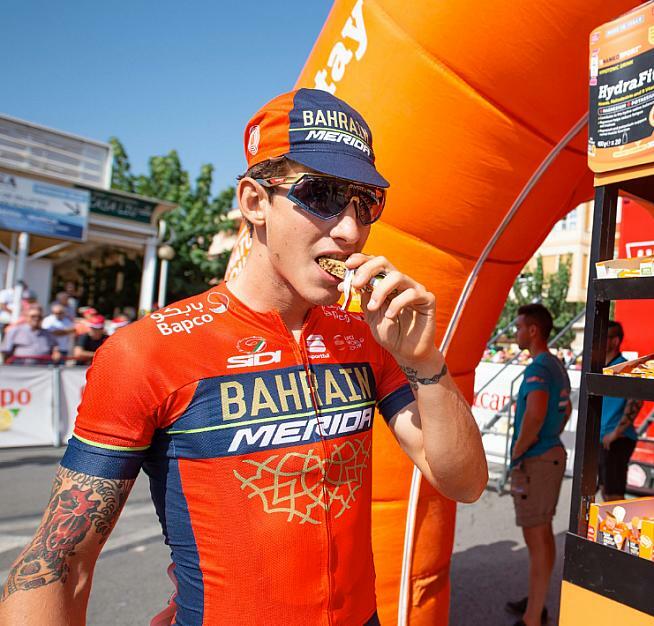 NAMEDSPORT> fuel the pro cyclists of Trek Segafredo and Bahrain Merida as part of their involvement in elite cycling. Developed and made in Italy, NAMEDSPORT> was founded in 2014 "with the aim of producing products for sportspeople using the best raw materials & formulations available." NAMEDSPORT>'s mission is to match the lifestyle of athletes who not only want performance but also follow a natural healthy lifestyle. Their products have been developed through intensive research conducted in collaboration with a team of pharmacists, scientific researchers, physiotherapists, coaches and nutritionists. Most of NAMEDSPORT>'s products are vegan or vegetarian certified, and they're also flying the environmentally-friendly flag, aiming to take a green approach to all stages of its production process. Thumbs up so far. NAMEDSPORT> promotes its products as a multi-sport supplement with a vast range of products to help you fuel while exercising, recover after effort, lose weight, gain weight, and everything in between. In the years the brand has been around they have linked themselves very effectively to both events and teams that we, as cyclists, all know and love. Events they sponsor include La Vuelta, the Tour de Yorkshire and the Giro d'Italia. NAMEDSPORT> have alsp partnered with pro cycling teams UAE, Trek Segafredo, Astana and Bahrain Merida - and their site flaunts the contributions their products made to Vincenzo Nibali's victory in 2016's Giro. Let's hope for a little of that magic. NAMEDSPORT> have a range of over 100 sports supplements so you can tailor a nutrition package that suits you. The bundle I received from NAMEDSPORT> included some HydraFit Electrolyte Drink Mix, a Total Energy Boost supplement, Total Energy Fruit Bar, Pure Energy Gel, and Crunchy Protein Bar. All these products are intended for use before and during cycling, except the protein bar which can be eaten before or after sport and, say NAMEDSPORT>, "replenishes protein levels after a workout promoting recovery or as part of a meal replacement plan". The energy bars are made using real fruit and vitamins, which is a positive, whoe the Pure energy gels are made to a recipe of "five simple and complex carbohydrates with different absorption rates to provide continuous and gradual energy". I tested NAMEDSPORT>'s supplements across two club runs and a chain gang. I'm coming back from taking a month off the bike and, honestly, I was happy these supplements landed on my desk as I really expected to struggle with endurance and keeping up with the group. The first club run was a chilly Saturday morning spin of about 30 miles. The second club run, the next morning, was a 50 mile spin, and I finished the testing with a 20-mile chain gang. Us 'athletes' are a picky bunch. While we're happy to quaff many a pint Friday night down the pub and eat without discretion when off the bike, we expect our sport supplements to be made of the best quality ingredients before we allow admittance into our temples. 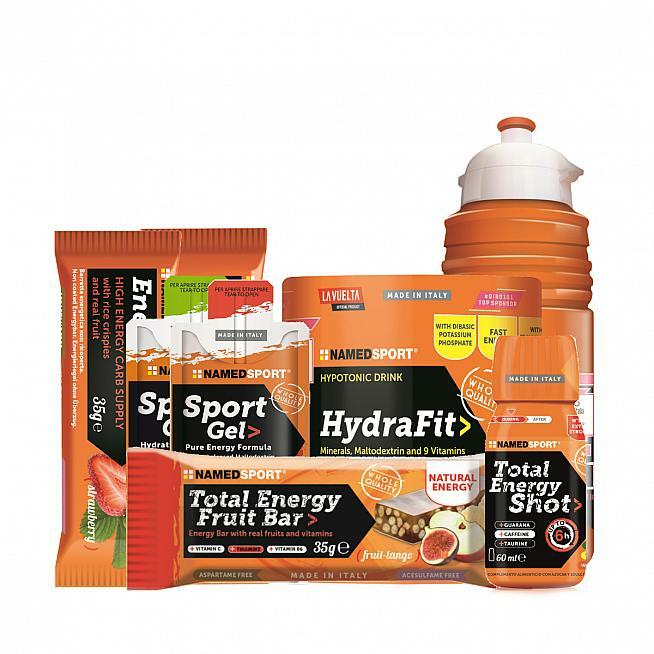 NAMEDSPORT> doesn't make understanding the ingredients lists easy - the orange packaging with tiny white text will have even those with the best eyesight guessing what the ingredients list says - but you can find full details of the ingredients and nutritional composition of each product on their website. Apart from the fine print, packaging wise, everything was as it should be. Getting into the bars was no problem. The gel packaging has a unique design - more of a pouch than a sachet, with a straw built-in. NAMEDSPORT> claim there's "no mess, access made simple with easy to use straw". And it is easy to use... once you're in. The tear line runs across the straw, so I found it easier to open on one side of the straw and then on the other as opposed to tearing off in one continuous motion. Once you're in though, goodness abounds and, certainly, there's no rolling up the packaging to try squeeze out even half a gel like in conventional packaging. Across all three rides I made up a bidon of electrolyte drink from the HydraFit powder provided. This mixes into a "hypotonic and electrolyte" drink that's formulated to replace mineral salts lost through perspiration while exercising. There's no scoop to measure out the right amount for a bottle, so you've either to eyeball it or dig out a scoop from another container. That's not a criticism, far from it - better that than including yet more disposable plastic with each product - but you'll want to have a scoop handy to ensure accurate dosage. If you're tired of seeing the same flavours crop up time and again, you'll be pleased to find NAMEDSPORT> have gone to great lengths to develop an original range of flavours and combinations. Given the overwhelming colour of NAMEDSPORT>'s branding, it's no surprise the electrolyte powder is an orange flavour (actually, blood orange). The drink has a nice flavour to it and is very refreshing. The gels I tested came in flavours from orange, cola-lime and lemon ice tea. Now, in my experience gels don't usually taste of what the packaging claims they do, and this was no exception: the lemon ice tea, in particular, was nothing close to ice tea. I had flashbacks to when my mum used to make me drink prune juice as a child. Fortunately, the effect from the gels wasn't the same as prune juice. Some gels make me feel funny, but these gels from NAMEDSPORT> didn't - and I mean that in a good way! Caribbean fruits - not the sort of thing you'll find growing in the hedges of Sussex mid-January. 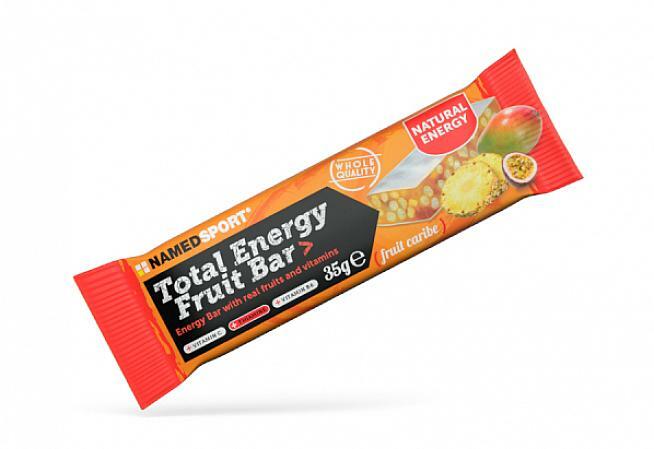 The bars (both the protein and energy) have also been developed with a number of flavours - Raspberry Dream, Fruit Caribe (which google translates from Spanish as 'Caribbean fruits' - in this case pineapple and papaya) and Fruit Tango. The energy and protein bars are aspartame- and acesulfame-free and have a range of fruits from pineapple, papaya, mango, coconut, apple, grapefruit and fig. The bars are a really good size for munching while out on a spin, are moist enough that you won't choke on them and are quite tasty! Very definitely a natural, fruity flavour and texture to them. Well, I was right. Take a month off the bike, go to a sunny destination, eat too much food and you'll suffer when you go to get back on the bike again. As well, I'm guilty of being a surger - put me on the front, give me a hill or a town sign... I'll try and push. But, I found the powders, the gels and the bars helped keep me balanced. I tried to remain mindful not to get anywhere close to the wall, and happily munched, slurped and drank keeping energy levels up. I'm happy to report, thanks to NAMEDSPORT>, I was able to carry on as usual - I surged off the front and went for the hills. For £11.95 you can try out the NAMEDSPORT> sample pack including free next-day delivery. The supplement industry is awash in brands all claiming to optimise performance. NAMEDSPORT> clearly face a challenge, like their competitors, to carve out a unique selling point, particularly where they're primarily sponsoring cycling events, yet marketing to multiple sports. The products are good, if not outstanding relative to others, and it will be interesting to see what NAMEDSPORT>'s next moves are to continue carving out market share. One clear strength is the sheer breadth of their range. With over 100 products, and an excellent website that allows the "sportsman" (someone fix that, for goodness sake! - Ed) to filter products by ingredients and their goals, it seems a safe bet you'll be able to put together a package that suits your needs. 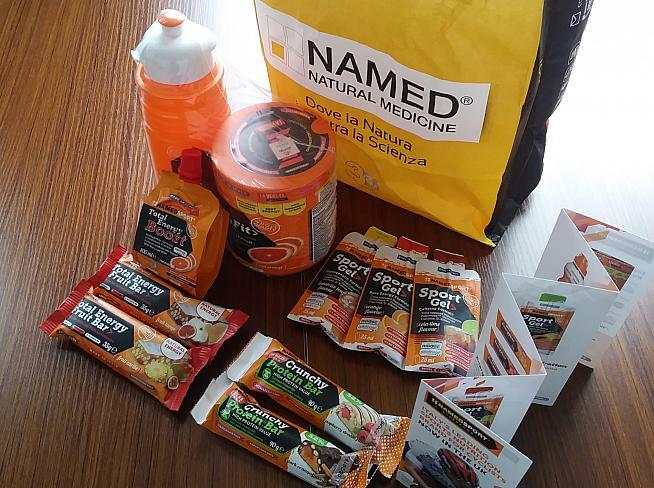 If you'd like to try NAMEDSPORT> out for yourself, you'll find a starter pack, similar to the one I tested, available on their website priced £11.95 including next-day delivery.